Fifteenth in a series of posts celebrating 200 years of Jane Austen’s Mansfield Park. For more details, open Your Invitation to Mansfield Park. This week’s guest post is by David Monaghan, Professor Emeritus at Mount Saint Vincent University in Halifax, Nova Scotia. He’s the author of Jane Austen: Structure and Social Vision, the editor of Jane Austen in a Social Context and New Casebooks: “Emma” (all published by Macmillan) and co-author with John Wiltshire and Ariane Hudelet of The Cinematic Jane Austen (McFarland). When I was a graduate student at Dalhousie I had the good fortune to audit his class on Austen and film, and I’m very happy to introduce his post on that “ranting young man,” Mr. Yates. To the theatre he went, and reached it just in time to witness the first meeting of his father and his friend. Sir Thomas had been a good deal surprised to find candles burning in his room; and on casting his eye round it, to see other symptoms of recent habitation and a general air of confusion in the furniture. The removal of the bookcase from before the billiard-room door struck him especially, but he had scarcely more than time to feel astonished at all this, before there were sounds from the billiard-room to astonish him still farther. Some one was talking there in a very loud accent; he did not know the voice – more than talking – almost hallooing. He stept to the door, rejoicing at that moment in having the means of immediate communication, and opening it, found himself on the stage of a theatre, and opposed to a ranting young man, who appeared likely to knock him down backwards. At the very moment of Yates perceiving Sir Thomas, and giving perhaps the very best start he had ever given in the whole course of his rehearsals, Tom Bertram entered at the other end of the room; and never had he found greater difficulty in keeping his countenance. 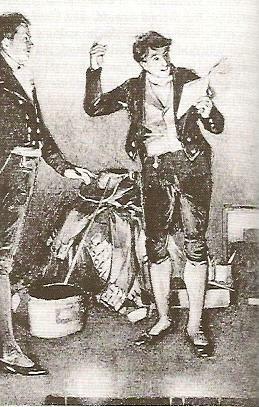 His father’s looks of solemnity and amazement on this his first appearance on any stage, and the gradual metamorphosis of the impassioned Baron Wildenheim into the well-bred and easy Mr. Yates, making his bow and apology to Sir Thomas Bertram, was such an exhibition, such a piece of true acting as he would not have lost upon any account. It would be the last – in all probability the last scene on that stage; but he was sure there could not be a finer. The house would close with the greatest eclat. In order to properly explain my admiration for the paragraph that presents Sir Thomas Bertram’s on-stage encounter with Mr. Yates, I need to first go back a few pages and take a look at another theatrical moment. This occurs as the various dynamics that develop in the course of the amateur theatricals organized by the young people at Mansfield Park reach a point of crisis with Fanny Price’s capitulation to demands that she take a part in the play Lovers’ Vows. As rehearsals start up again and Fanny, stunned by the enormity of her moral compromise, experiences the “tremors of a most palpitating heart,” so Jane Austen saves the day with a deus ex machina in the form of Sir Thomas Bertram’s unexpected return from Antigua. Not only is Fanny spared but the theatricals and the dangerous relationships for which they have provided a cover are brought to a rapid conclusion. However, the decisiveness of the moment is illusory. Sudden interventions from outside are not the way things work in a Jane Austen novel. The role of deus ex machina is one that fits the patriarchal Sir Thomas’s self-image but Austen immediately calls its validity into question when, rather than follow theatrical convention and drop Sir Thomas into the centre of the action, she keeps him offstage, leaving it to the hysterical Julia to announce his arrival. Even more significant, we have only reached the end of the first volume and, beyond terminating the play, nothing of any real significance is resolved by Sir Thomas’s return. In this instance, then, Austen is mocking theatrical convention and using it to point out the differences between her approach to story-telling – where resolutions are developed out of a gradual and complex process involving social interactions and decisions based on serious reflection – and one that relies on arbitrary and unexpected interventions from outside. How Austen might have actually used theatrical convention had she been writing plays rather than novels is indicated by the brief incident on which I mainly want to focus. Even here, Austen never entirely strays from novelistic conventions and one of the delights of the scene is her decision, without precedent elsewhere in the novel, to filter the action through the consciousness of Tom, the character best qualified to see the funny side of his father’s discomfiture. Nevertheless, it is Austen’s exploitation of its theatrical possibilities that makes this scene, set appropriately on a stage, stand out. Second, she again demonstrates her powers of visual representation in describing the “gradual metamorphosis [from] the impassioned Baron Wildenhaim into the well-bred and easy Mr. Yates,” a performance which is for Tom, here serving as a surrogate audience, “such a piece of true acting as he would not have lost on any account.” Delightfully comic in themselves, these few words are also extremely effective in pointing up the broader social implications of the emphasis placed on role-playing during the theatricals. For a few brief moments, then, we gain a real insight into the type of plays that Austen might have written had she chosen a different means of artistic expression. Not for Austen, the contrived effects and melodramatic emotions of a theatre based on the tired conventions of classical drama. On the contrary, hers would have been witty and profound social comedies that allied the brilliant dialogue frequently to be found in her novels to a keen visual sense. It is the sheer delight of seeing a great artist switch briefly but with great effect into a different register that makes the paragraph discussed above my favourite in Mansfield Park. 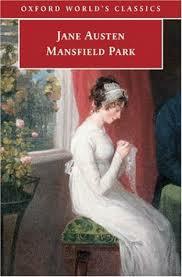 To read more about all the posts in this series, visit An Invitation to Mansfield Park. Coming soon: guest posts by Diana Birchall, Deborah Barnum, Laurel Ann Nattress, and Lorrie Clark. Subscribe by email or follow the blog so you don’t miss these fabulous contributions to the Mansfield Park party! Yes–a truly hilarious scene, beautifully written for full comic effect. I was interested to read that this is the only scene in the book seen from Tom’s point of view. Thank you for pointing this out. Related to this, and also worth noting, is that this is one of the very few scenes in all of Austen’s finished works that has no women in it. That was truly funny! When I first read this account, I held my breath in terror anticipating the reaction of Sir Thomas. I had to revisit chapter 19 to analyze this quote in context. A portion of Miss Austen’s brilliance is her ability to place a vivid mental image in the mind of the reader’s eye. The author builds such incredible comic tension into this scene with everyone anticipating Sir Thomas’s assessment of the events. Isn’t also ironic that Mr. Yates would eventually become the son-in-law of Sir Thomas? I’ve often described Jane Austen’s humor as a hammer wrapped in velvet in the way she manipulates the subtle transition of Mr. Yates under the most formidable of circumstances. If you love reading Jane Austen’s novels, you won’t want to miss An Invitation to Mansfield Park, an ongoing discussion hosted by Dr. Sarah Emsley, who has scheduled on her blog a series of guest posts in celebration of the two-hundredth anniversary of the publication of the novel. This week’s post, “Jane Austen: Dramatist,” is by the Mount’s Professor Emeritus David Monaghan. Professor Monaghan has published several books on Austen; his guest post is reblogged here. Very nice insights into the theatrical aspects of Austen’s writing, but I can not quite agree that “beyond terminating the play, nothing of any real significance is resolved by Sir Thomas’s return.” Fanny has been strongly opposed to the play and her resolve severely tested. She actually falters and agrees, only to be saved by the return of Sir Thomas. That arc of the story is ended, and Fanny’s moral dilemma is over. She will be severely tested again with Henry’s proposal. After Sir Thomas returns Fanny is something of a rising star at Mansfield Park (it helps that Julia and Mrs. Rushworth are gone). This culminates in the ball and Henry’s proposal. In some sense Fanny’s childhood ends and her maturity begins with the return of Sir Thomas. By the end of the second volume she will be in need of all that maturity. Thank-you for calling attention to the deus ex machine manqué role that Sir Bertram is supposed to play. I hadn’t noticed that. I would say that it occurs to me that Austen is mocking Sir Bertram – or calling attention to his cluelessness – as much as she is mocking theatrical conventions. Quite unlike a god, Sir Bertram has no idea what’s going on and is in no way able to put things right as we soon see. Also, thanks for calling attention to the fact that it’s Tom’s consciousness through which we see this scene. Another thing I hadn’t noticed and, typical for Austen, absolutely spot on. This is such a fabulous scene, and I love the Tom’s-eye view. He’s the ideal narrator since he has the least to lose and so can see all the comic potential of the situation in a way that Edmund or Fanny or the girls could not. I think that Fanny is willing, at this point, to seize on Sir Thomas as a deus ex machina, since his return closes many of her immediate trials in regard to the play (and also does cause her star to rise, as ccassidy314 points out above). But it is partly Sir Thomas’s increased regard for Fanny that makes him come down so harshly on her when she rejects Henry’s proposal, and makes him (Sir Thomas) think that she is teachable enough and of sufficient taste to understand the hard lessons of Portsmouth. A theater of Austen would have been fascinating, since in her novels she doesn’t feel constrained by the unities or by tired formulas such as the “well-made” plays that became popular later on on the Continent.